A PRISONER SHACKLED to a hospital bed and guarded by a police officer in Allegheny County, Pennsylvania, somehow obtained a key to his handcuffs and used a nurse as an obstacle as he hopped off a stretcher and escaped, the county’s chief deputy sheriff said. Allegheny County Chief Deputy Kevin Kraus said investigators were still trying to determine exactly how Alexander Erb, 26, of Glassport, escaped from UPMC McKeesport hospital and eluded authorities for more than 16 hours on Monday. 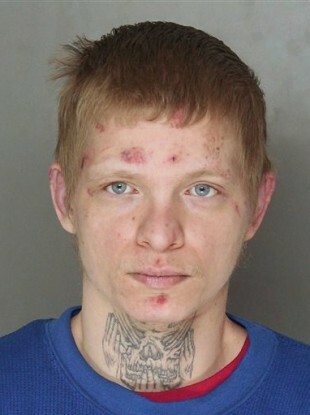 Glassport police first arrested Erb after a domestic dispute, then took him to the hospital about 10 miles southeast of Pittsburgh for treatment. Erb escaped at about 1am on Monday and wasn’t rearrested until about 5.30pm, when authorities found him in a residence about 2 miles away, hiding under a bed with a 16-year-old girl, Kraus said. Authorities haven’t said how Erb knew her. “There was a nurse in his room and he was able to unlock part of the shackle connected to the bed under his covers,” Kraus told The Associated Press. Erb then asked the nurse to adjust the thermostat, putting her in the deputy’s path, according to a criminal complaint charging Erb with escape, resisting arrest and possessing an instrument of crime — the key. Erb waited until the nurse was between the deputy and the door of his hospital room before jumping off the bed and running away, Kraus said. The key Erb had was made of a composite material and smaller than the metal keys used by county deputies, so they know it wasn’t stolen from a law officer, Kraus said, but they still don’t know where or how he got it. “It was a universal key for those types of restraints,” Kraus said. The sheriff’s deputy was guarding Erb because he was wanted on an arrest warrant in another jurisdiction and was supposed to be transferred once he was discharged. Kraus called the escape “unacceptable” and said investigators need to determine how it occurred so it doesn’t happen again. Online court records don’t list an attorney for Erb. Email “This prisoner somehow managed to escape despite being shackled to a hospital bed”. Feedback on “This prisoner somehow managed to escape despite being shackled to a hospital bed”.